Village- Sayar. Patti- Uday Pur Tall 2nd. Forrest Resort in Rajaji National Park is spread over 10 acres and emanates luxury and affluence clubbed in the ambience of wilderness. This wildlife resort promises to invigorate and sustain the enduring buzz of encountering adventure and its actualization. You can get the chance to enjoy the blissful pristine of the natural habitat interspaced with the tranquility of the surroundings at this resort. This luxurious Forrest resort amidst the thick lush green forest is interspersed with the majestic Ganges and other water bodies. The serene environment calls for an experience to be one amongst ferocious tigers, swift leopards, solitary bears, creepy cobras, deers and chattering monkeys. Note: The FORREST, RAJAJI is operational between Oct - May. 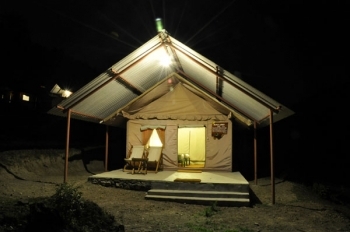 Forrest Resort has 20 well-appointed superior swiss cottages tents set in the background of rustic environs providing opulent and intimate memorable experiences. The cottages provide simple pleasures in life - emanating a healthy comfortable stay. The cottages have attached toilet and bath with running hot and cold water. Provisions of intercom and tea coffee makers are also available. 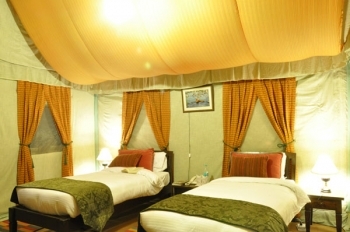 Electric blankets and hot water bags are also provided at the resort to restore the warmth of the place.